He described the practice as “trickery of the worst type”. 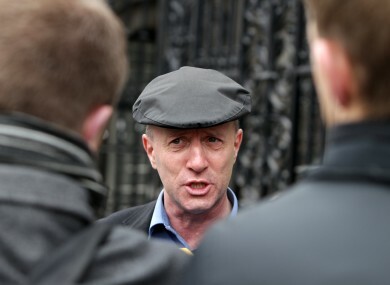 KERRY TD MICHAEL Healy-Rae has claimed that gardaí purposely deployed speed vans to ‘catch football supporters coming home from a match’ last month. In a statement today, the outspoken deputy alleged that six cameras were placed between Duagh and the Six Crosses on 28 August after Kerry played Dublin in the All-Ireland semi-final in Croke Park. He says they were put in place at the exact time that fans would have been entering that part of the county. “Further down in south Kerry, four more speed vans were deployed just at the time to try and catch Kerry supporters coming home again from the match again on that Sunday,” he added. This in my opinion is disgraceful, I am all for road safety, but to be purposely deploying extra resources to try and catch Kerry supporters coming home from a match is a disgrace. Healy-Rae also took issue with speed vans being used for what he said was the first time in Farranfore village on Monday. “A van was secretly parked in a very discreet location within the town limit, trying to catch motorists who may be doing one or two kilometres more than the speed limit,” he alleged. He described the practice as “trickery of the worst type”, accusing the state of using it as a money-making exercise. He added: “When the whole idea of speed vans was envisaged, it was to save lives and to be open and transparent in identifying where the vans were and creating an awareness amongst motorists to slow down and keep within speed limits. Now it is a money making exercise and a method of doing everything they can to increase the amount of penalty points bestowed upon road users and in many cases be the cause of people losing their licenses. In other areas – like Fossa just outside of Killarney – it is like “shooting fish in a barrel the way they are catching people for being a couple of “kilometres over the speed limit”, he added. The deputy has contacted the local Chief Superintendent regarding the issue. Gardaí said it would not be appropriate to comment on statements made by elected representatives when contacted by TheJournal.ie about Healy-Rae’s grievances. However, they did say that the deployment of GoSafe vans has “resulted in a significant reduction of fatalities in each of the collision zones”. “The Road Safety Authority (RSA) recently published research that speed remains the single most significant factor in fatal traffic collisions,” they added. In April, the authority confirmed that speed was a factor in 322 road deaths between 2008 and 2012. Weekends were noted as high-risk times. Email “Michael Healy-Rae: 'Speed cameras purposely deployed to catch Kerry football fans'”. Feedback on “Michael Healy-Rae: 'Speed cameras purposely deployed to catch Kerry football fans'”.